For a limited time only get an autographed copy of Alexandra's book for only $5.99 + S&H. Click here to find out more. Do you subscribe to the RSS feed of Chess Killer Tips? the bandwidth for the CKT podcast. CHESS KILLER TIPS - Voted World's #1 Video Podcast. Podcast Alley. In August #1 of all 1,160 video podcasts in all categories of video podcasts!! Voted best in "chess blog, video, or podcast" for 2008 by Chess Journalists of America! Thousands of subscribers. Subscribe to RSS, or to iTunes. Submit positions, ideas, ad requests and feedback by sending me an email. Vote for me at Podcast Alley in the box to the left. Please vote each month. Support: ChessQueen Chess Store supports my bandwidth, please buy there. Recommended Chess Video Sites: Chessmovies, Tubechess, Youtube's ChessQueen Channel. CKT 018: Fritz 10 Teaser. 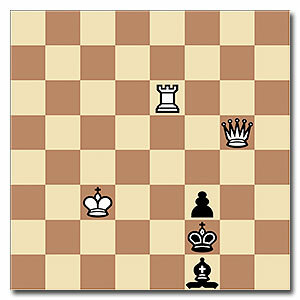 Mate in 2 Chess Problem that Fritz 10 cannot solve. White plays and mates in 2 moves. Presented by Guest Star Almira Skripchenko. The Free Flash Tutorial Chess Killer Tips is based on modern video codecs and is guaranteed to work with iTunes (PC and Mac), iPhone, Video iPod, and AppleTV. Flash versions of this vodcast are available. Most vidcast episodes run from 1 to 3 minutes and are efficiently encoded to minimize download times. Chess lessons and chess instruction will never be the same after you have experienced Alexandra's chess screencast. Free online tutorials in the format of free video podcasts are ideal and can be watched any time you choose. Your Chess Games will improve in quality and you will win more games. a thank-you gift in return!